College football is back. I've read some of the analyses of my Hawkeyes and they mentioned that defense could be a problem this year. The offense has a bunch of new faces and could also be spotty. Well, that's the whole team right there. Hope, however, springs eternal for the Hawkeye fan. Yesterday was the annual Iowa-Iowa State contest. I ran my errands to make it back in time for the 11 a.m. kick-off. This is usually a game shown on TV. Um...flipping channels yielded children's programming, nature shows, the US Open, a discussion of rugby (!) and football game from the SEC, but no Iowa-Iowa State. I remember, with sadness, when you could pretty much count on your team being on free TV at least once or twice during the season. Teams and conferences weren't in the chase for the almighty buck that, let's face it, with the scandals in the NCAA, don't go to the schools or trickle down to the Chemistry or English departments but stay with the coaching staff in the athletic department. You used to want your team on free TV. If you played well, it was a huge recruiting boost. Now, you need to pay to watch them. But I did find a live stream off ESPN. It was the basics but it told me close to real time, what was happening. 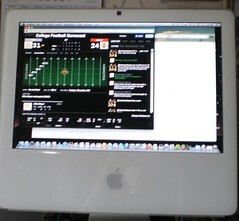 I guess that will be my "TV" this year when the powers that be don't deign to put Iowa on national TV. After yesterday's 44-41 loss in overtime to Iowa State, it's going to be a long, painful season to watch anyway. I've got a food bet with my son-in-law on our Big 10 season opener October 8th against Penn State. I best start baking now.